To be able to predict, prevent, or slow down development of antibiotic resistance, the molecular mechanisms that drive development of antibiotic resistance need to be understood. Antibiotic resistance can develop in three distinct ways: through horizontal gene transfer, chromosomal mutations, or phenotypic adaptation. In Escherichia coli, the first stages of de novo development of antibiotic resistance occur on a phenotypic level, controlled by adaptation on the gene expression level . After this initial stage, mutations appear that, in most cases, confer a reduction in bacterial fitness [1–3]. Often, this is followed by the appearance of compensatory mutations that reduce the loss in fitness without reducing the acquired resistance . Adaptation of the wild-type to amoxicillin (Table 1) resulted in two well-scrutinized mutations in the ampC promoter [1, 13], and in mutations in ompR, citF, and rpoD, all with a population frequency of 1. One of the replicate strains acquired a mutation in waaB in addition to these mutations. In the wild-type strain adapted to enrofloxacin, either ten or eleven genes were mutated, and a low-frequency mutation occurred in mutL. Mutations in gyrA, parC, parE, soxR, and acrR, commonly associated with resistance to fluoroquinolones [14–16] were accompanied by less frequently observed mutations in the genes proY and yciO. 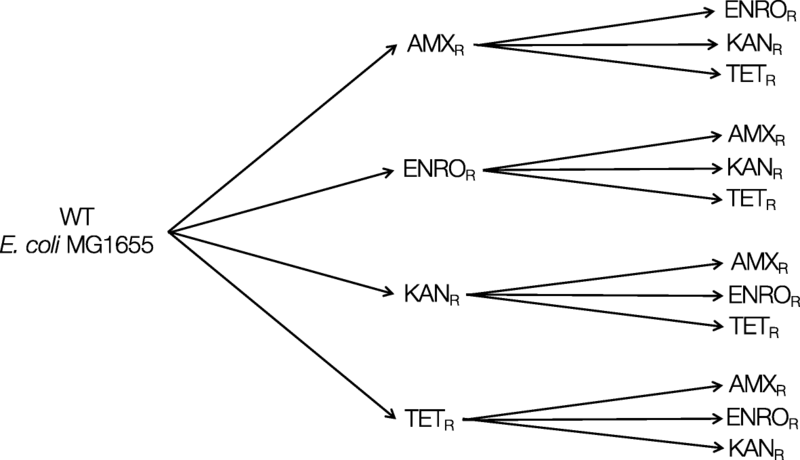 In addition, mutations in the 5′ UTR of rpsJ, ybjL or ybjM, and gtlB were detected. When wild-type cells were exposed to kanamycin, mutations accumulated in sbmA, sapF, cpxA, npr, fusA, and the 5′ UTR of uidA. Interestingly, a mutation in gyrB, most often associated with resistance to fluoroquinolones , was identified with a population frequency of 1 in both wild-type-adapted strains. 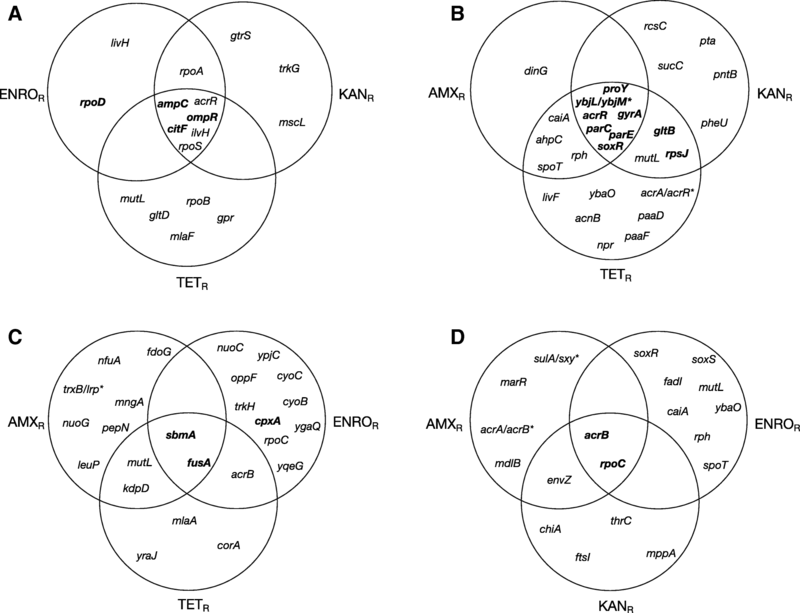 Development of resistance to tetracycline in wild-type E. coli resulted in mutations in acrR and acrB, ompF, mlaA. A mutation in rpoC was only detected in a strain with partial resistance to tetracycline. During resistance development, adaptation to one antibiotic can result in an increased or decreased susceptibility to other antibiotics, a concept known as collateral sensitivity or collateral resistance. This is a concept often employed to develop strategies to limit resistance development [43–47], but is not observed in the resistant strains generated in this study  and can therefore not explain the drug-specific effect on loss or maintenance of resistance. 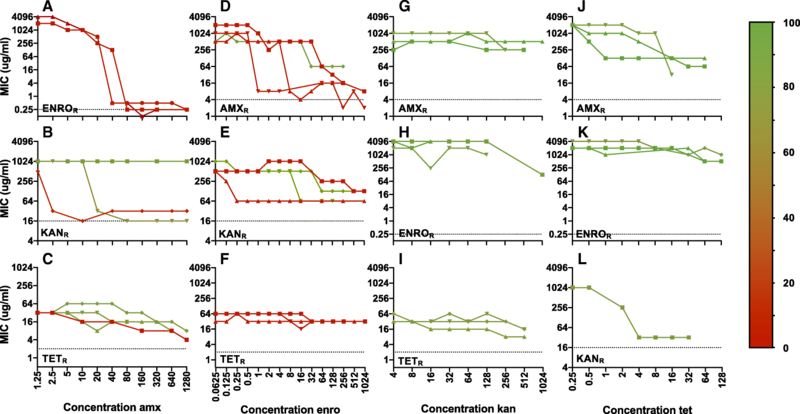 Similar experiments in Pseudomonas aeruginosa show a very similar pattern on resensitization of antibiotic resistant strains, where the effect clearly seems to depend on the combination of the antibiotics, but no explanation is available as of yet  .